Tech Talk at SSCL – This site offers news and discussions about: technology, digital library content, online library resources, tech assistance available at the Southeast Steuben County Library – and sometimes we talk about books too! Hi everyone, here are the top New York Times fiction and non-fiction bestsellers for the week that ends April 28, 2019. A college freshman leaves behind a reliable boyfriend in her hometown and falls for a bad boy. An Army intelligence officer must commit a crime or lose her kidnapped husband and daughter. Sally Grissom investigates the disappearance of President Harrison Tucker’s wife. A Russian count undergoes 30 years of house arrest in the Metropol hotel, across from the Kremlin. An M.I.T. professor receives a phone call from her recently deceased screenwriter friend. In 1914, the New York socialite Eliza Ferriday works to help White Russian families escape from the revolution. Bernie Gunther joins the Murder Commission in Berlin in 1928. The final Bernie Gunther novel completed before the author’s death. A former professional golfer visits the course in Scotland. A depressed young man’s secrets are exposed when the grocery store where he works becomes a crime scene. Investigations by Leaphorn, Chee and Manuelito overlap in the desert Southwest. A concentration camp detainee tasked with permanently marking fellow prisoners falls in love with one of them. A pregnant 18-year-old has limited time to change her mind about giving her baby up for adoption. A look at congressional gridlock and the first two years of Trump’s presidency. The fight for Reconstruction’s promise, the terror ignited by Jim Crow segregation and its modern reverberations. A bold new approach to how we gather that will transform the ways we spend our time together—at work, at home, in our communities, and beyond. In The Art of Gathering, Priya Parker argues that the gatherings in our lives are lackluster and unproductive—which they don’t have to be. We rely too much on routine and the conventions of gatherings when we should focus on distinctiveness and the people involved. At a time when coming together is more important than ever, Parker sets forth a human-centered approach to gathering that will help everyone create meaningful, memorable experiences, large and small, for work and for play. Drawing on her expertise as a facilitator of high-powered gatherings around the world, Parker takes us inside events of all kinds to show what works, what doesn’t, and why. She investigates a wide array of gatherings—conferences, meetings, a courtroom, a flash-mob party, an Arab-Israeli summer camp—and explains how simple, specific changes can invigorate any group experience. The result is a book that’s both journey and guide, full of exciting ideas with real-world applications. The Art of Gathering will forever alter the way you look at your next meeting, industry conference, dinner party, and backyard barbecue—and how you host and attend them. Shrill is an uproarious memoir, a feminist rallying cry in a world that thinks gender politics are tedious and that women, especially feminists, can’t be funny. Millie realizes, helping herself to love and joy. The husband is astonished―everyone adores the new Millie. She can’t put a foot wrong, and as they move deeper into Africa in search of lion myths for his book, “excitement and pleasure carried her upwards as on a tide.” Mysteries abound, but in the hands of Rachel Ingalls, the ultimate master of the curveball, Millie’s resurrection seems perfectly natural: caterpillar to butterfly. Edinburgh’s most famed detective duo―”Nine-Nails” McGray and Inspector Ian Frey―face their most metaphysical mystery yet, as they investigate a series of crimes surrounding the miraculous waters in the remote Loch Maree. A mysterious woman pleads for the help of Inspectors Are and “Nine-Nails” McGray. Her son, illegitimate scion of the Koloman family, has received an anonymous death threat―right after learning he is to inherit the best part of a vast wine-producing estate. In exchange for their protection, she offers McGray the ultimate cure for his sister, who has been locked in an insane asylum after brutally murdering their parents: the miraculous waters that spring from a small island in the remote Loch Maree. The island has been a sacred burial ground since the time of the druids, but the legends around it will turn out to be much darker than McGray could have expected. Murder and increasingly bizarre happenings will intermingle throughout this trip to the Highlands, before Frey and McGray learn a terrible truth. The catalog of physical materials, i.e. print books, DVDs, audiobooks on CD, etc. *Magazines are available for free and on demand! You can check out magazines and read them on your computer or download the RBDigital app from your app store and read them on your mobile devices. You can access digital library content on PCs, Macs and mobile devices. 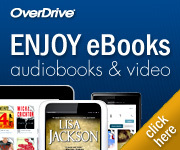 For mobile devices simply download the OverDrive, Freegal or RB Digital app from your app store to get started. If you have questions call the library at 607-936-3713 and one of our tech coaches will be happy to assist you. The Budos Band describes their music as “doom rock Afro-soul big band with a ’70s touch.” I agree with their assessment and would add they also incorporate a pinch of experimental style into the mix. If you like late sixties R&B and vintage rock and jazz from the same era, you should enjoy the music of The Budos Band. V (Five) is the group’s brand new fifth album and it features the songs Old Engine Oil, The Enchanter, Six, Ghost Talk and Maelstrom. Mike Flanigin is an Austin, Texas-based blues musician who has worked as a sideman for decades. The Drifter is his first solo album and he’s backed up by some terrific front line players including Jimmy Vaughan, Billy Gibbons, Gary Clark Jr. and Clem Burke. This is a fun modern blues album! Songs in the set include The Drifter, Fit to Be Tied, Stop the World, One Little Heart and This Life. The Flaming Groovies are a traditional rock band who hail from San Francisco. Their first album was released in 1969 and they reformed to record and release this LP in 2017. The band features Chris Wilson on guitar and vocals, Cyril Jordan on guitar, George Alexander on bass and Victor Penalosa on drums; and unlike many albums released by groups who have long been apart and then reunited to play – this one is successful – it features a solid collection of traditional rock songs including: Have You Seen My Baby? Whiskey Woman, City Lights, High Flyin’ Baby and Yesterday’s Numbers. In researching this LP online, I couldn’t find out when it was recorded. The music was recorded live, apparently during a single concert. Judging by the tone of the voices of Collins, Lightfoot and Dobson who today range in age from 79-80, I believe this album was recorded in the sixties. This is a fun classic folk album including the songs: Mountain Thyme & Golden Thread by Judy Collins, Bend in the Water and If You Could Read My Mind by Gordon Lightfoot and Morning Dew & Winter’s Going by Bonnie Dobson. Bruce Hornby and his band The Range burst onto the music scene in 1986 with an upbeat piano-centric album titled The Way It Is. In the years since Hornsby has branched out writing songs for other artists, playing jazz and bluegrass and even playing the keyboard with The Grateful Dead. The Essential Bruce Hornsby collection features 29 songs and includes hits, B sides and a couple of live tracks. It offers a nice overview of Hornsby’s work and includes the songs: The Way It Is, The Valley Road, Black Rats of London, Mandolin Rain and Every Little Kiss. Spring Cleaning playlist features 79 songs with a run time of 5 hours and 43 minutes. The playlist features an upbeat collection of songs some of which feature a cleaning theme and others, including Loverboy’s Working for the Weekend and Billy Joel’s I Go To Extremes seems to included to get you moving fast as you clean! The collection features a mix of song old and new including Suds in the Bucket by Sara Evans, The Vacuum by Buckcherry, Picking Up The Pieces by Paloma Faith, Elbow Grease by Billy Sheehan and Yakety Yak by The Coasters. Bonus: It is the wrong time of the year for listening to holiday music but what a great album! I know it is April and not November, however, this 1962 album is super cool! It features great versions of popular holiday songs by classic jazz artists. Songs on the LP include: Jingle Bells by Duke Ellington, White Christmas by Lionel Hampton, The Christmas Song by Carmen McRae, We Three Kings by Paul Horn, Santa Claus is Coming To Town by The Dave Brubeck Quartet and Blue Christmas by Miles Davis. Christmas music in April is cool, even as the weather turns warmer! Did You Know…The Library Has A Makerspace! The library does indeed have a makerspace! Our Makerspace is called Creation Station and, basically, it is a place to go and use tools old and new to be create new things including 3 D printed items, sewing projects, Cricuit cutting machine projects, buttons and more. And we hope to see you at the Twin Tiers Mini Maker Faire on Satuday, April 27, 2019! And this week, just for fun, I’m going to recommend the first book in a few, mostly historical fiction series – so you can binge read away! Dissolution is an utterly riveting portrayal of Tudor England. The year is 1537, and the country is divided between those faithful to the Catholic Church and those loyal to the king and the newly established Church of England. When a royal commissioner is brutally murdered in a monastery on the south coast of England, Thomas Cromwell, Henry VIII’s feared vicar general, summons fellow reformer Matthew Shardlake to lead the inquiry. Shardlake and his young protégé uncover evidence of sexual misconduct, embezzlement, and treason, and when two other murders are revealed, they must move quickly to prevent the killer from striking again. A “remarkable debut” (P. D. James), Dissolution introduces a thrilling historical series that is not to be missed by fans of Wolf Hall and Bring Up the Bodies. Back home in England, Bess receives an unexpected response from the dead soldier’s family, for neither Jonathan Graham‚ his mother‚ nor his younger brother admit to understanding what the message means. But the Grahams are harboring a grim secret, and Bess must, somehow, get to the bottom of it. It is her sacred duty to the dead, no matter how painful, or dangerous, that obligation might be. In the first installment of an iconic historical mystery series, a medieval monk seeks a saint’s remains for Shrewsbury Abbey—but finds a murderous sinner instead. A Welsh Benedictine monk living at Shrewsbury Abbey in western England, Brother Cadfael spends much of his time tending the herbs and vegetables in the garden—but now there’s a more pressing matter. Cadfael is to serve as translator for a group of monks heading to the town of Gwytherin in Wales. The team’s goal is to collect the holy remains of Saint Winifred, which Prior Robert hopes will boost the abbey’s reputation, as well as his own. But when the monks arrive in Gwytherin, the town is divided over the request. When the leading opponent to disturbing the grave is found shot dead with a mysterious arrow, some believe Saint Winifred herself delivered the deadly blow. Brother Cadfael knows an earthly hand did the deed, but his plan to root out a murderer may dig up more than he can handle. Before CSI and Law & Order, there was Brother Cadfael, “wily veteran of the Crusades” (Los Angeles Times). His knowledge of herbalism, picked up in the Holy Land, and his skillful observance of human nature are blessings in dire situations, and earned Ellis Peters a Crime Writers’ Association Silver Dagger Award. A Morbid Taste for Bones kicks off a long-running and much-loved series that went on to be adapted for stage, radio, and television. In the first novel in Winston Graham’s hit series, a weary Ross Poldark returns to England from war, looking forward to a joyful homecoming with his beloved Elizabeth. But instead he discovers his father has died, his home is overrun by livestock and drunken servants, and Elizabeth―believing Ross to be dead―is now engaged to his cousin. Ross has no choice but to start his life anew. Thus begins the Poldark series, a heartwarming, gripping saga set in the windswept landscape of Cornwall. With an unforgettable cast of characters that spans loves, lives, and generations, this extraordinary masterwork from Winston Graham is a story you will never forget. Now a fugitive running for his life, Sebastian calls upon his skill as an officer during the war to catch the killer and prove his own innocence. In the process, he accumulates a band of unlikely allies, including the enigmatic beauty Kat Boleyn, who broke Sebastian’s heart years ago. In Sebastian’s world of intrigue and espionage, nothing is as it seems, yet the truth may hold the key to the future of the British monarchy, as well as to Sebastian’s own salvation…. For King and Country. No matter the cost. With the backing of his uncle, General Penrod Ballantyne, young Leon Courtney joins the King’s Rifles of Nairobi. When he becomes discouraged by the dishonesty of army life, his uncle recruits him for a special mission – spying on the Germans in East Africa, whom the General suspects are preparing for the Kaiser’s war. Posing as a professional game hunter Leon is tasked with gathering information on one is his clients, a wealthy industrialist Otto Von Meerbach. Leon finds himself falling for von Meerbach’s beautiful mistress but never forgets that his real mission is to destroy the enemy. But how easy will he find his task when his true enemy is closer to home than Leon ever expected? Did that really just happened? Has he gone insane? Was it all a dream? Did he have a brain tumor? Desperate for answers, sets out to find them and discovers that the mystery can only be unlocked by a strange piece of fiction that holds the truth about the magical kingdom. But he isn’t the only person searching for the missing manuscript, and his rivals will stop at nothing to get it first. To complicate matters more, Austin soon discovers that he has no control over when he passes between worlds, and finds himself out of trust for even the simple things, like walking through doorways. Stuck between dual realities –charged for a murder he doesn’t recall in one and running from a maniacal billionaire who’s determined to kill him in another– Austin’s monotonous life has become an epic adventure of magic, murder, and political intrigue in both the New Republic of Galiana and the streets of Los Angeles California. Wisecracking cop turned private investigator Bernie Gunther specializes in missing persons, and as the Third Reich’s power has grown, Bernie has become a very busy man. But as he takes on cases involving millionaire industrialists, stolen diamonds, and Hitler’s most powerful cronies, Bernie finds himself mired in the brutality and corruption of a country on the brink of war. Hard-hitting, fast-paced, and richly detailed, March Violets is noir writing at its blackest and best. A solid marriage, a thriving business, and the esteem of their close-knit Alabama community—Joyce and Odell Watson have every reason to count their blessings. Their marriage has given well-off Joyce a chance at the family she’s always wanted—and granted Odell a once-in-a-lifetime shot to escape grinding poverty. But all that respectability and status comes at a cost. Just once, Joyce and Odell want to break loose and taste life’s wild side, without consequences . . . When their new neighbors turn out to be high-steppin’ bootleggers Milton and Yvonne Hamilton, the Watsons plunge headlong into good times and fast living. For Joyce, Yvonne is someone she can show off to—and look down on. And Odell won’t introduce crude, unsophisticated Milton to his friends—but is happy to let Milton ply him with free booze. As much as the Watsons want to get along with their new neighbors, the gradual revelations of Yvonne and Milton’s seedy past make them think twice about how much time they spend together. But the Hamiltons won’t be dismissed so easily. The Watsons soon find them invading every area of their lives and discovering their long-held secrets. Now, the Watsons must tread carefully to keep the Hamiltons from destroying their perfect world. Hi everyone, here are the top New York Times fiction and non-fiction bestsellers for the week that ends April 21, 2019. The 14th book in the Ali Reynolds Series. An imprisoned fertility doctor seeks revenge. The 24th book in the Eve Duncan series. A violin prodigy with a tragic past is kidnapped. A young woman’s well-ordered life is disrupted by the I.T. guy from her office. Grace Healey investigates the fates of 12 women who were sent to occupied Europe to help the resistance during World War II. The eighth book in the Expanse series. The 49th book in the Stone Barrington series. A memoir by President Obama’s longest-serving senior advisor.